This was the place of our first caravan trip and we were not disappointed. The owners, Keith and Kath are themselves experienced caravan and campers so they know exactly what's needed and they haven't skimped. With the help of the Wardens Brian and Andrea they run an extremely good site. Together they offer an efficient and great service in beautiful surroundings. The courtesy and help shown to all is well above the norm. The site is divided into three sections for the 60 pitches. Two level fields and one very slight sloping. Electric hook-up available at all if required. The toilet and shower facilities are second to none and the site was awarded 'Loo of the year' in 2006. Showers and all hot water, free. They have also been awarded numerous other accolades such as the David Bellamy Conservation award. They are very big on environmental care. The site is situated approximately a half mile from junction 49 of the M4 (Pont Abraham) in a South facing suntrap surrounded by trees beside a river. Idyllic setting. 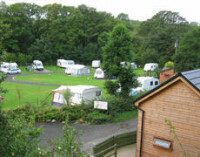 Prices are extremely competitive with the cost of the standard pitch for all camping types with ehu starting at £12 pn in low season and the most expensive being the serviced pitch at £17.50 pn in high. Great people, great site, spotless facilities and a perfect setting.